Reminiscence is one of those smaller brands that I don't think about as often as I should, but when I do think about it, I remember how much I like it. It's primarily a Paris-based jewelry company dating back to the 1970s, with a line of cheerful bohemian-chic fragrances that fits its design aesthetic. Tonka is a recent release (2013), developed by perfumer Fabrice Pellegrin. It belongs to Reminiscence's "Les Classiques" fragrance collection (joining Vanille, Ambre, Patchouli and Musc), and it is an oriental gourmand with notes of bergamot, anise, clove, jasmine, honey, cistus, bitter almond, tonka bean, vanilla and musk. I'd never heard of tonka until I started reading fragrance message boards in the early 2000s; just to refresh our memory, tonka is a flowering tree with the botanical name Dipteryx odorata, and its wrinkly brown seeds ("tonka beans") yield a coumarin-heavy absolute that smells sweet and nutty and grassy and spicy all at once. (Victoria has written a very helpful post about tonka and coumarin at Bois de Jasmin.) Tonka is definitely the star of its namesake Reminiscence fragrance: it comes across as deep and multi-faceted, like an earthier vanilla with hints of spice and almonds. The tonka heart is surrounded by a natural-smelling anise and waves of musky honey. Yes, there's a gourmand feeling, but the spice and musk balance the sweeter notes nicely; Reminiscence Tonka is definitely not a cupcake scent. Thanks to the combination of anise and bitter almond with vanilla and tonka notes, Reminiscence Tonka feels (to me) like a softer, less smoky, more wearable cousin to Serge Lutens Un Bois Vanille, and I mean that as a compliment — Un Bois Vanille and I have never really gotten along. Although Tonka is categorized as a feminine fragrance, it could be worn by men who appreciate a touch of spicy-woody sweetness in fragrance. As the last weeks of Winter 2014 wear on, and I'm still wrapped in layers and layers of wool clothing as protection against the "polar vortex," I'm appreciating Tonka's comforting warmth and richness. Cold weather is always a good time to wear full-on orientals and gourmands, and this one has fit perfectly into my seasonal wardrobe. Reminiscence Tonka is available in 50 ($70) and 100 ml ($95) Eau de Toilette. For purchasing information, see the listing for Reminiscence under Perfume Houses. Note: top image is Tonka Beans [cropped] via Wikimedia Commons. So glad you like this. It’s one of my winter staples. It has just enough complexity to be interesting, yet it seems to be okay in an office with a lot of perfume-haters. I get a lot of anise, which I love along with almonds. It reminds me ever so slightly of Tom Ford’s Tobacco Vanille. I’m sure to perfume experts that might be stretching things, but I get a bit of tobacco pipe smell. Hoping that they might add some body products to the line. Anyone try their Vanille? No, I think you’re right — there is something about this fragrance that reminds me a tiny bit of pipe tobacco. I might just be thinking of the cherry/almond tobacco that one of my grandfathers smoked from time to time. The anise makes is more unusual and grown-up than most gourmands, imho — it’s a good winter staple and it’s “adult” enough for the office, without being loud! I don’t smoke, and I hate being near cigarette or — heaven forbid— cigar smokers, but I do love the smell of a good-quality pipe tobacco! Thanks for the review: the perfume sounds lovely and right up my alley! 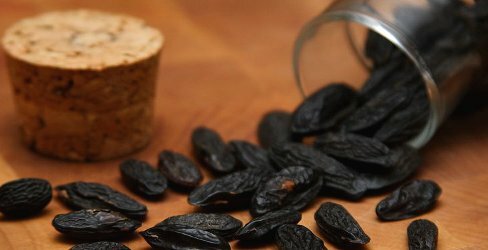 And I love tonka beans: reading about them in perfume notes made me curious about these rugged dark beans – I found some, and I’ll say this: my apple cakes and creme anglaise (or any type of cream, really) have never been so good. I’m glad I live in Europe, for once, since Tonka beans here are perfectly legal! I didn’t know until I was doing research for this review that tonka beans are illegal as food/flavoring here in the US! This makes me want them all the more. Eek, right? but who knows. I like Reminiscence Ambre, but have not yet tried Tonka and I feel the need to check it out! I also really like their bottles (slight concave shape to the front and covered with gold or silver stars). I love their packaging! It’s lively but not silly. I think they know what they’re good at, and they do it very well. I may want to sample this one! I like gourmand, non-gourmand perfumes. Sounds very cozy. I recently received a sample Hermessence Brin de Reglisse curious about the licorice note. It’s with lavender, so quite different, but I do love that note and I really like this perfume. Anise is essentially licorice, right? Floragal, yes, anise has a very licorice-y scent, although I believe that anise and licorice actually come from different plants! Now this does sound good. I have only vaguely heard of the brand, but I think I might give it a try. After years if niche explorations, and having to purchase samples because of where I live, I’m now very hard to tempt, but tempted I am after your review! I might also test Ambre and Vanille. A Guerlain counter I once wandered past in another city had a jar of tonka beans you could sniff. They are terrific. I think Le Labo might have a jar of tonka beans in their NYC boutique, too. I’ll have to check next time I’m there! Oooh, I am feeling lemmingish. Beautyhabit has 20 mLs of the Vanille and the Musc. Thanks for reviewing a not so well-known (to me anyway) line. I now have a whole bunch of Reminiscence samples on my STC Wish List. I love smaller size bottles, too. And I’m very grateful to the sampling sites, as well as sites like Luckyscent that offer samples! This brand is huge in France – it’s at all the perfume stores. Patchouli is their classic scent and I smell it quite frequently out and about. I think you’ll like Tonka if you like Back to Black as it is in this style but more gourmand and fluffy. I think it’s a great perfume – it always lifts me up and makes me feel quite cosy. Might be too much for summer though – depending on how hot it is where you live. I agree that it might be a little bit too heavy for hot summer weather, but it’s perfect for autumn and winter! After browsing their website, I like some of Reminiscence’s jewelry, too. Their Patchouli is my favorite. It’s got a touch of “hippie” and a wonderful cozy dry down. One spritz is more than plenty and it Lasts forever. Quite powerful stuff. I think Robin is a fan of one of their Patchouli! I like their whole stylish-hippie inspiration.